There is a back story about the highest mountain in Georgia, but that’s for another day. Today, the feared Blood Mountain was square in front of us. Hey Man! and I camped at Lance Creek, a primitive site at the foot of the mountain. The climb would begin in the morning on minute one with step one. Around nine of 10 thru hiker blogs describe Blood Mountain as torture. I was about to take the test and find out. It might do well to note that I’ve lived in the Peach State on three separate occasions. Most recently in Atlanta. I really do appreciate the beauty of this state. I really do. As for Blood Mountain – Georgia is this your best shot? If so, nice mountain, but not a serious challenge. The hike up is nicely switchbacked and punctuated with excellent stone steps which ease the effort. The iconic 1934 stone shelter on the summit is surrounded by giant boulders that add a mystical note. The descent on the northern side is another matter. Think of it as a tossed rock salad garnished with slick leaf litter and mud from the overnight rain. I skied down more than I hiked. 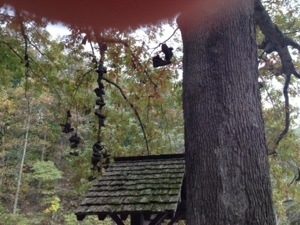 Aside from one loss of dignity, a turtle, all ended well at Neel Gap’s iconic shoe tree. Better yet, the stay included a shower, laundry and a warm bed.